Thank you all so much for your suggestions on San Francisco eating and drinking! There is a whole load of places that one person recommended. I'm not having an easy time picking here, as some of the places that only one or two people recommend sound quite interesting. As much so as the most popular place on this list, Slanted Door. I will continue to enjoy looking through menus, and thanks again for your advice. Imagine this: maybe 150-200 years ago, somewhere in eastern Europe, a person of modest means is thinking of what to cook for the family. It's winter and there's not a lot to choose from. In the cellar there are potatoes and onions. There is a sack of flour. There are some eggs, there is a bit of butter. Perhaps it was in a setting like this one when a person had the brilliant idea of making potato pancakes? I have no idea at all if this is true. Maybe a trained chef at an Austrian cooking school invented the dish. 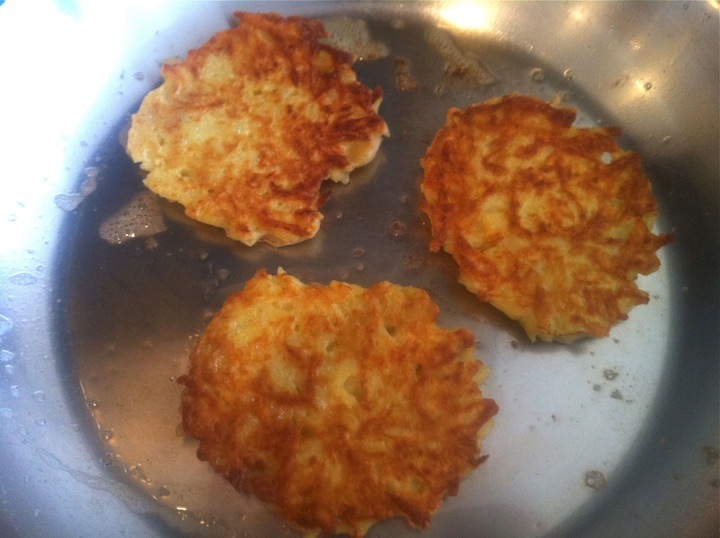 Maybe the potato pancake was invented 75 years ago, or 300 years ago. Isn't it interesting to imagine how a person, someone who must be a creative and brilliant chef, is able to take familiar and humble ingredients and come up with something that is so delicious that it proliferates the way a potato pancake, for example, proliferates? I like making potato pancakes with the daughters. The other night they were the center of a meal, along with a little split pea soup and a cucumber salad. Couldn't be simpler - peel and grate 2 russet potatoes. Sprinkle with a little salt and let them sit a few minutes so that they begin to release their water. Squeeze out as much water as you can, add two beaten eggs, a tablespoon and a half or so of flour, some salt, and a tablespoon or two of finely grated onion (more or less as you please). Mix well, fry in butter, et voila. 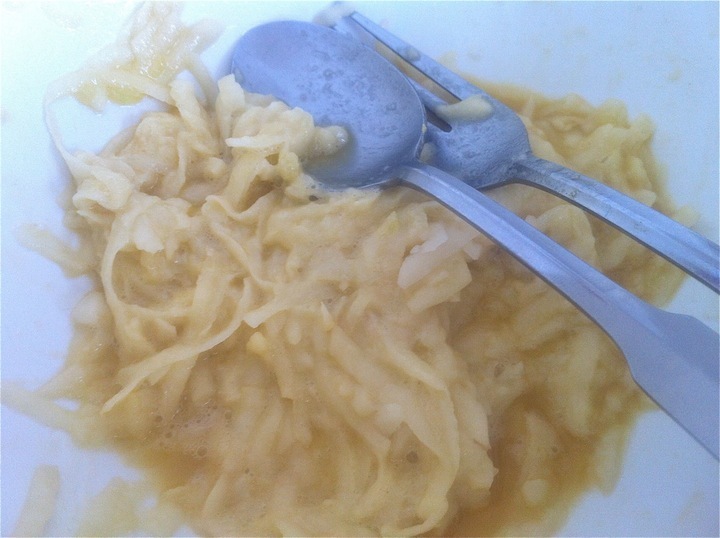 Although it's important to remove the water from the potatoes before making the batter, this is a forgiving dish. On this evening we got distracted from our cooking for maybe 5 minutes, and still the potatoes continued to release water, or maybe the bond between the egg and the potato began to relax. But there was liquid in the bottom of our batter bowl. No matter - we lifted out large spoonfuls of batter and pressed them into pancake-shaped discs in a hot pan of butter. This is one of those simple dishes whose aroma will bring neighbors to the front door, the perfect time to come and say hello. 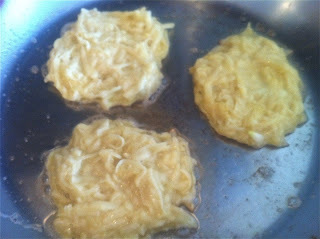 Turn the pancakes after a few minutes when they are golden brown on the bottom. Remove after another few minutes and let them rest a moment on a paper towel, getting rid of some excess butter. Six year-old daughters can peel Persian cucumbers, and can even help chop them into large chunks, if we hold the knife together. 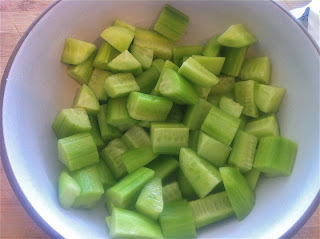 They can salt cucumbers and add a little vinegar, and stir. They can not, however, drink a glass of 2011 Bernard Ott Gruner Veltliner Am Berg. For this, I feel badly for them, although their time will certainly come. Right now they think wine is gross and don't even want to taste it. The wine, be the way, has improved since last year, showing a lovely airy freshness, herbal and creamy notes, and good balance. A great value at about $18 before any sort of case discount. 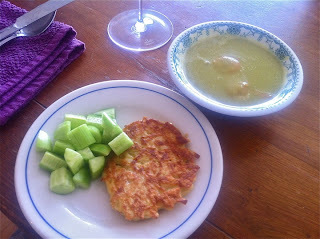 With a bowl of split pea soup with chunks of carrot and little bits of ham (calm down, also home made), the humble potato pancake and the humbler cucumber salad make a very good dinner. The person who first thought to create a pancake out of a few potatoes, an onion, a few eggs, some flour and salt - this is a person who must have enjoyed wine with their meal. Perhaps it was home made from a few rows out behind the house? Maybe it was even a Gruner Veltliner. I have to travel to San Fran for work in April and I haven't been there in 20 years. I know almost nothing about the city. I'm wondering if I can ask you, dear readers, to share your recommendations for good eating in San Fran. Breakfast, lunch, and dinner ideas welcome - anything that's good to eat, from the rickety and run down place with the best tacos to the nicer place with great food and a good wine list. The other night a friend came over for dinner and he brought with him a bottle of white Burgundy, a wine that reminded me why it is that I love white Burgundy. 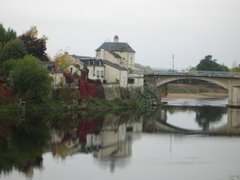 Not that I needed a reminder - some of the finest wines I've ever drunk have been white Burgundies. I'm not put off by the bottles that don't live up to expectations, even though these can be costly disappointments. Wine in all categories can be disappointing, and I don't buy the cliché about Burgundy being "hit or miss." All wine is hit or miss when you get right down to it. Storage, bottle variation, and many other factors can reduce the experience of any given wine. And when white Burgundy is on, it is as thrilling as wine can be, to my taste. The funny thing is, on paper this wine didn't have to be so good. 1994 is not considered to be a good vintage, for one. And this wine comes from Puligny, but the producer is better known for white wines from Meursault. 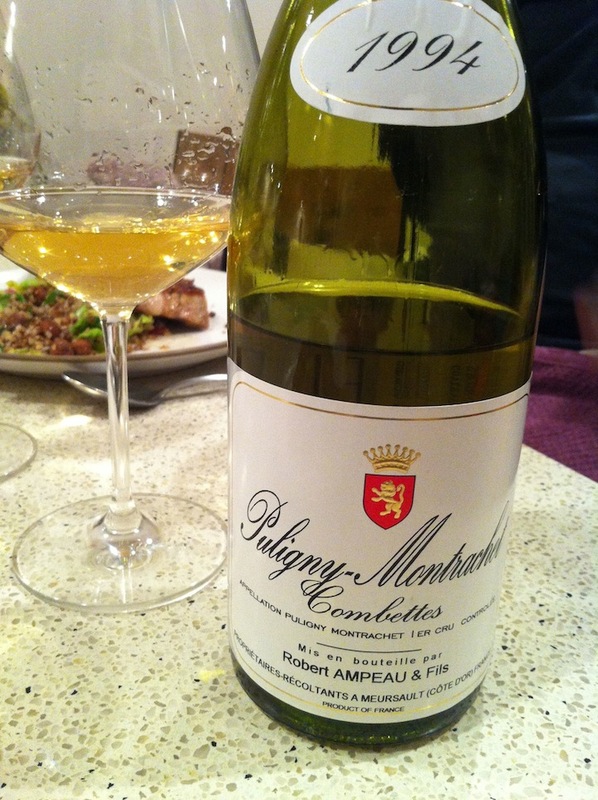 That said, the 1994 Robert Ampeau & Fils Puligny-Montrachet 1er Cru Les Combettes was a very good wine. Not the greatest of white Burgundies that I've had, even recently, but very good, particularly considering the difficult vintage. And the wine made me think quite a bit. We opened it and tasted, maybe a half hour or so before we would begin drinking it. My friend who brought the wine was not terribly impressed, and I understood why - it seemed dilute, without much concentration. But we had graduated college in 1994, and we also were probably not terribly concentrated in 1994, needing time to gain complexity and become more serious. We have since done that, and with a little air, the wine did too. 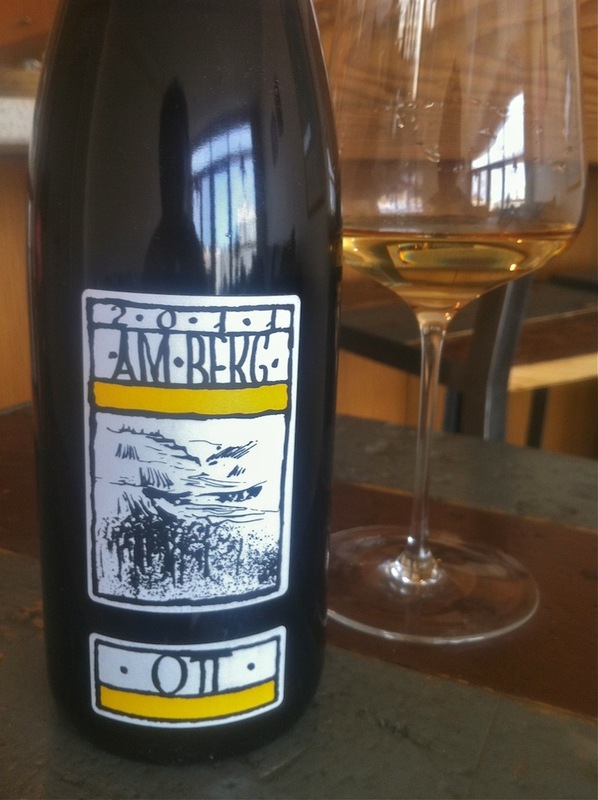 It never fully lost that dilute feeling, but it did blossom aromatically and although not a wine with much sap or richness of body, it absolutely and clearly articulated itself and showed a very lovely delicacy to its aromas and flavors. That's not a cop out way of explaining away a mute wine. It is a truthful description of the wine's character. Not every wine will be powerful, rich, and with concentrated flavors. You already know that, but I'm just saying. Mature white Burgundy can be great and can do so in the character of something light in body, delicate, almost fragile. I've not had other vintages of this wine so I don't know, maybe this is always the character of Ampeau's Combottes. Somehow, I doubt it. 1994 was not an easy year, with lots of rain and other problems. Many people wrote off the vintage, and today's prices for '94s are lower than any other vintage in the '90s. But I've had several examples of 1994 Burgundy in the past months and have really enjoyed them. So, what about this particular wine: I loved the clean and pure articulation of aroma, incense and stone and spring water. And I loved the delicate way those aromas tranlslated on the palate, finishing with some pungency, leaving a lingering incense and mineral essence that didn't so much stain the palate, but left an impression nonetheless. The goût de terroir of Puligny seems somehow more sharply etched than elsewhere. The fruit is defined and powerful yet restrained, like the musculature of a martial artist. Its perfect composition is revealed by its ability to withstand magnification. 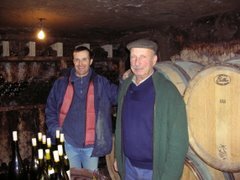 As you increase resolution, from commune level Puligny to premier cru and then zoom to Batard-, Chevlalier- and Le Montrachet, you find no blemishes, no distortions in taste or balance. I hadn't read this section of the book in a while and the day after drinking this wine, went back for a look. This paragraph struck me in its description of Puligny's restrained character, something that I am learning to see in the wines, especially in relation to the brawnier wines of Meursault, Puligny's neighbor to the north. Combettes is a vineyard that borders on the Meursault appellation, and probably has more flesh than some Puligny wines (which may have something to do with why Ampeau's Combettes in 1994 is as successful as it is). And still, the character of this Combettes, to me anyway, was unmistakably Puligny. Kramer also talked about the ability to withstand magnification, and I like thinking about this. Maybe the idea can be extended to vintage. In a riper vintage like 2003 for example, the essential restraint should still be evident. And in 1994, for example, a lesser vintage, there is no distortion in taste or balance. Maybe this sounds like a simplistic thing to say, but maybe it would be easier for those of us who love Burgundy if we stop hoping that every bottle will be a great thing, if we let go of our ideas of the heights a bottle should ascend to. I'm not saying that we should dumb it down or stop expecting the wines to be great. But that it's also nice to allow a 1994 to be a 1994, and to appreciate it for whatever its charms may be. So apparently you can pickle vegetables merely by adding salt and then waiting a little while as the water is drawn from the cells. This quick pickling method can take as little as 5 minutes if you are David Chang, or it can take longer, but my sense is that it's up to the pickler to decide how long the pickling will take. Not long ago I ate dinner at a friend's house and he served napa cabbage quick pickled in salt, and it was delicious. I resolved to do some quick pickling of my own. 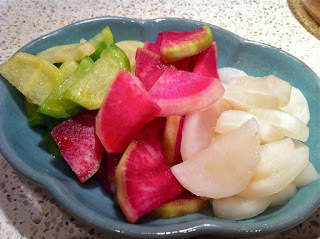 And so the other day I found myself with a trio of radishes, and tried my first quick pickle. I used one each of daikon, the large and somewhat mild carrot-shaped radish, watermelon radish, which is a colorful and very mild radish, and the very pungent green meat radish. 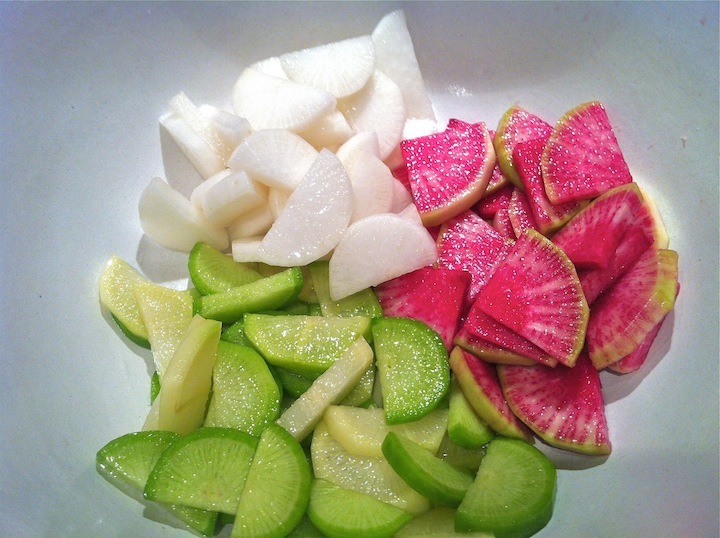 I harbored the secret hope that the bright colors and taming effect of pickling might induce my children to try the radishes. I peeled them and sliced them in half and quarter moons, and added maybe a bit more than a tablespoon of coarse kosher salt. Tossed well, and let them sit for a half hour. They were delicious immediately, so this actually was not so easy to do. A half hour later the radishes had lost some of their luminous color and their firm crunch, but were delicious in a different, mellower way. I served them as a side dish with a dinner of breaded and fried chicken thighs and soba noodles. Both daughters tried them - they went for the watermelon radish, which shouldn't be a surprise. My younger one may actually have liked it, although she elected to mimic her older sister in expressing her dismay at the radish's flavor. I thought they were delicious. The next day I tossed the leftovers in a few drops of sesame oil, and that was some serious deliciousness. There will be more of this quick pickling happening in my house. Supposedly there are more words in the English language than in most other languages. And yet it feels as though we are limited in our ability to discuss some of the more important ideas - there just aren't enough words. I've read that there are over 40 words for snow in one of the Inuit languages. Makes sense - there are many different types of snow and if this is an important part of daily life, differentiating between these kinds of snow, it's natural that different words wold emerge so that people can communicate clearly. Although there apparently are a lot of words in English, we have only two that I can think of to describe warm feelings towards another person - "like" and "love." Shouldn't there be more than that? Aren't there gradations that we aren't giving efficient voice to? Same with "happy." There are many different kinds of happiness, but we have few words to differentiate here. There is the kind of happy you feel when a puppy bounds up and starts licking your face or the kind of happy you feel when holding a 6 month old baby. The kind of happy you feel when you've stepped inside from a soaking rain, or finally made it through security after a long line at the airport. The kind of happy you feel when you're finished taking a final exam, or the kind you feel when your test results are negative. The kind you feel when you get to the BBQ and open the back door to the yard, see everyone there talking and eating and having fun, and you haven't yet but are about to join the fray. There's even the weird kind of happiness you (or maybe just me?) feel when you are depressed about something, but finally give in and allow yourself to wallow in it in the comfort and safety of your own home - an exquisitely sad kind of happy. Where am I going with this. A fair question indeed, patient reader. Well, if a puppy licking your face is Beaujolais Nouveau, I think I've found a wine that for me best expresses the exquisitely sad kind of happy. 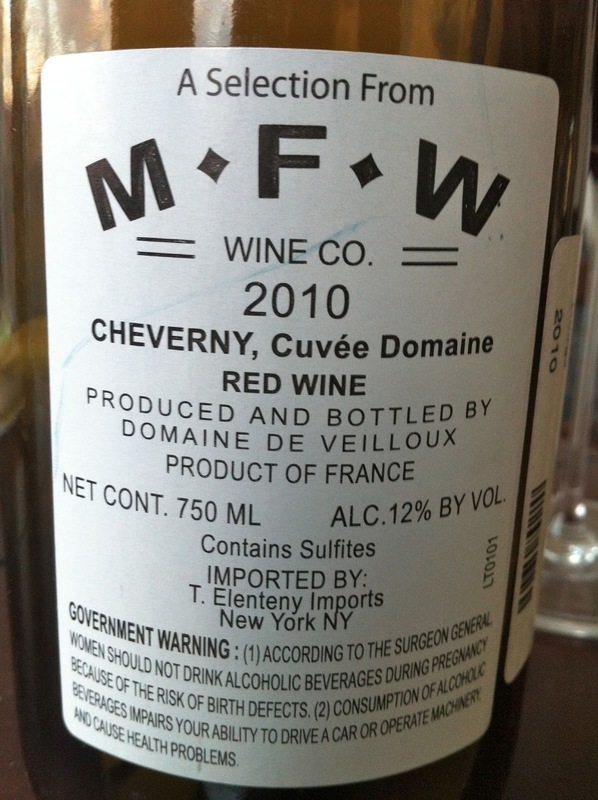 I'm talking about 2010 Domaine de Veilloux Cheverny Rouge. 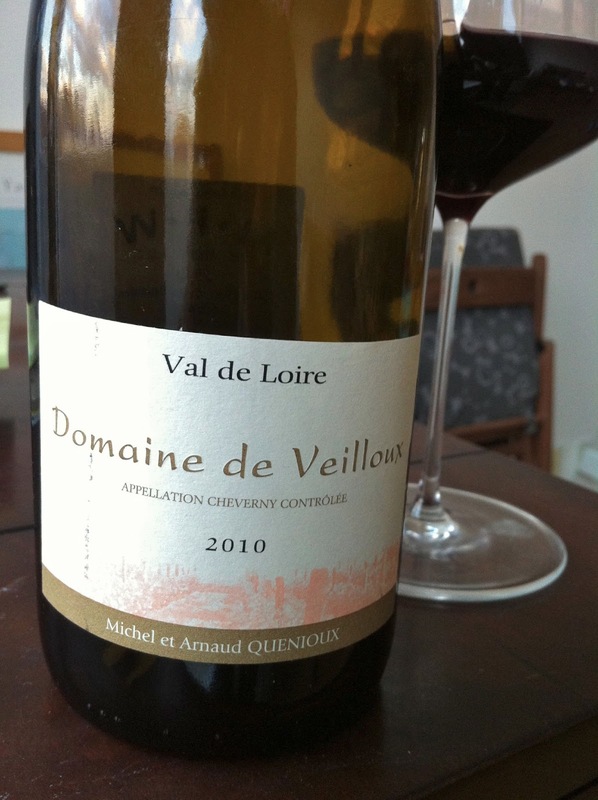 I opened a bottle a week ago or so and it was really difficult at first, loaded with reductive funk. But there was something accessible in there, a very lovely note of dried roses. 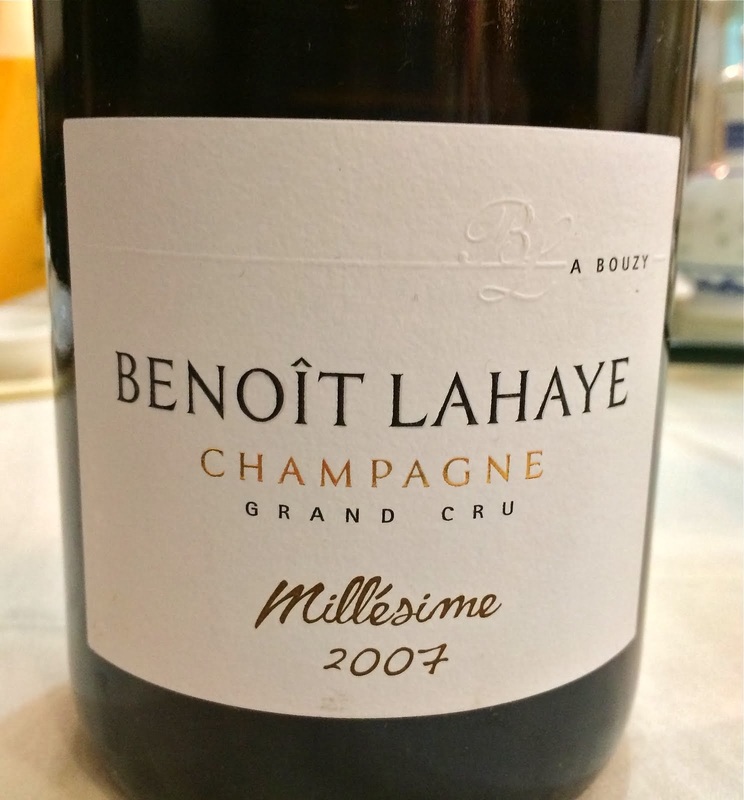 The next day the wine retained a tannic edge, but it showed such pretty fruit and floral tones, satisfying kernels of happiness inside of a challenging package. The wine is a blend of many grapes - Cabernets Sauvignon and Franc, Malbec, Gamay, probably Pinot too and I don't know what else. I do know that the wine is farmed biodynamically and organically and that 2010 is my favorite recent vintage for Loire wine. I also know that it is a selection of Michael Wheeler (a friend of the Dressners and much of the NYC wine world who moved out west) and Michael Foulk - their company is MFW Wine Co. This is a relatively new company, I think based in Portland Oregon, and their book includes some lovely wines that are direct-imported in NYC by David Lillie at Chambers Street Wines. There are some other wines too, things I've not heard of, including a lovely little Barbera called FUSO, made by Walter Massa - it's surprisingly good wine for $13. Veilloux Cheverny Rouge is an excellent argument for blended red wine, a complex, expressive, and delicious wine, but a wine whose happiness does not come easily. You need to wallow in in a bit first. It sips well on its own, but really shines with all sorts of food. It sells for something like $15-17, and it's worth looking for. I got mine at the excellent Slope Cellars in Park Slope, Brooklyn. Try it, if you're looking for that exquisitely sad/happy feeling.